Liferay’s Weather portlet displays basic weather-related information (temperature, conditions) for multiple configurable locations. It’s available as an app from Liferay Marketplace. For each configured location, a link to Open Weather Map is provided that points to more detailed information. The Weather portlet also provides a search bar that allows users to find information about locations that aren’t listed by the portlet. Searching via the search bar forwards the user to Open Weather Map, where the search is executed. Liferay’s Weather portlet displays basic weather-related information (temperature, conditions) for multiple configurable locations. To configure the displayed locations, open the Weather portlet’s configuration window. 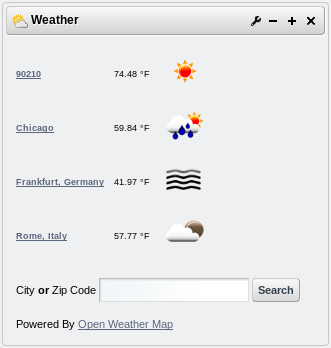 In the first text area, enter the names of the cities about which you’d like weather information to be displayed. Alternatively, you can use zip codes. Enter one city or zip code per line. For the temperature format, you can choose between Celsius and Fahrenheit. Sometimes you have a team of developers creating lots of plugins. Next, you’ll see how to create your own repository for those plugins.